Agate hunting is soon to be done for the year. I haven’t had time to go out, but a few of my friends have been diehards and have found a few small agates as of late. The agate finds featured this month include some found by Adam Nothelfer, who is from the Lapeer area of the Lower Peninsula. They are all very unusual, each for its own reason. First of all, there is the agate he found in on his family’s private property in a small lake in far northern Lapeer County, north of the town of North Branch. This lake was once a gravel pit and has produced masses of fossils, Petoskey Stones, and other minerals. This 1 pound 5.5 ounce agate is apparently the first agate to be found in the lake. According to Adam, the pictures DO NOT do this specimen justice. He says that “It is absolutely dreamy to get it wet and look at it under the magnifying glass. It has eyes all over it and areas of banding mostly white but some with red and pink floating in clear chalcedony.” The dimensions are 4.25″ x 3.5″ x 2.5″ — quite large for any agate. It certainly appears different than Lake Superior agates. If I were to guess, I would say that it is an agate that formed within a sedimentary rock pocket. Apparently Adam usually comes to Grand Marais to agate hunt. 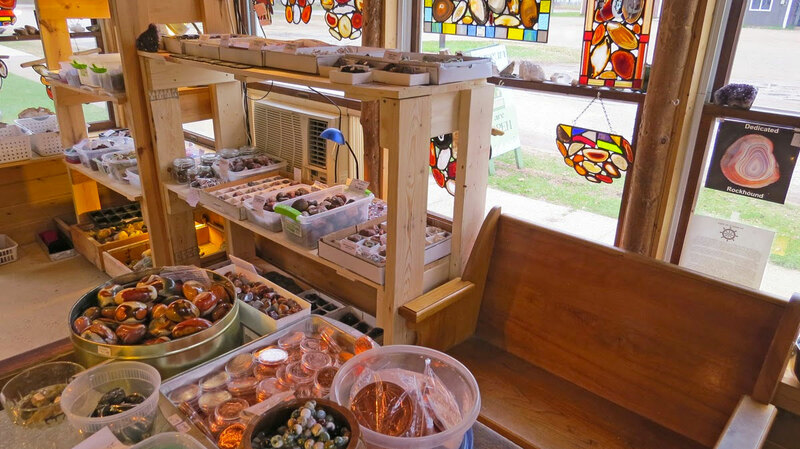 This year, he instead headed to the Keweenaw Peninsula and looked for copper replacement agate nodules at the Wolverine Mine. Pictured below are a couple that he pulled out of the basalt piles wherein the agate nodules fractured in half while still in matrix. Adam collected a large plastic coffee can full of nodules and hopes that more have banded agates inside, and maybe, some — with copper bands. The last agate picture agate sent to me is one of a yellow and white water level banded agate. It looks similar to others I have seen that come from Vermillion Beach. However, he says that he found this 3.5 pounder near Muskellunge Lake, east of Grand Marais around 20 miles. I have seen several of these, but have not had time to really study them. From what I can see in the emailed picture, it appears to have distinct water level bands that alternate between chert and chalcedony. It appears that this also was formed in a sedimentary rock pocket. If any of you readers have anything to add about any or all of these unusual agates, please send me an email to .